Poker is the most recognizable card game in the world and as such, has fascinated millions of recreational and professional players. The huge popularity the game enjoys has caused a number of poker variations to emerge. Different variations utilize different hand rankings. Some of the most popular poker variants that are based on the traditional “high” ranking include Texas Hold’em, Omaha Hold’em, Five-Card Draw, and the Seven-Card Stud. Then again, there are variations of poker which employ the Ace to Five lowball rankings. Games like Omaha Hi-Lo and Stud Hi-Lo poker fall into this category. With the following article, we aim to introduce less experienced players to the two most widespread poker hand rankings and explain which the worst starting hands in traditional “high” ranking poker variations like Hold’em are. But first, allow us to say a few words concerning basics like the deck used in the game and the number of players allowed at the table. The number of players, allowed to join the game simultaneously also varies from one poker variation to another. In Texas Hold’em and Omaha Hold’em, the maximum number of players is typically either nine or ten. The maximum number of players allowed in seven-card variations, such as Razz and Stud Hi-Lo, is usually set to eight. This is so because such games are dealt in a different way and have a different betting structure, unlike Flop-based variations like the popular Texas Hold’em. In all poker variations, the final hand of any given player always consists of five cards. As the cards’ suits are not ranked, if two players have the exact same hands that differ by suit, the two hands will be considered of equal rank. The ranking of the hands from the highest to the lowest are as follows – A, K, Q, J, 10, 9, 8, 7, 6, 5, 4, 3 and 2. In variations like the popular Texas Hold’em, each player is dealt two hole cards that are facing down. Then, three more community cards are placed in the center of the table. These are referred to as the Flop. Once participating players have checked, called, raised or folded, a fourth community card, called the Turn, is placed next to the Flop. Another betting round follows before the last or fifth community card, the River, is placed at the table. The next and final stage of the game is the Showdown, where players are required to show the hands they have formed to determine the outcome of the round. The player holding the highest ranking hand is declared a winner and claims the pot. The traditional “high” ranking of hands is predominantly used in popular variations of the game where community cards are in play and the betting structure involves a Flop, a Turn, and a River. Games like Texas Hold’em, Omaha Hold’em, and Seven-Card Stud are referred to as “high” games because the player holding the highest-ranking hand at the table collects the pot. When a standard deck of 52 cards is in play, there are nine high-ranking card categories. You can read a more detailed information on these below as we have ranked them all from the highest to the lowest hand. This is the strongest hand in poker which contains five cards that are all of the same suit, ordered specifically in a sequence from ten to an Ace. As there are only four suits of cards (spades, diamonds, clubs, and hearts), there are, respectively, only four combinations that can form a Royal Flush, namely [A][K][Q][J], [A][K][Q][J], [A][K][Q][J] and [A][K][Q][J]. Players, who are new to poker should remember that all suits are equal in this game. Although highly unlikely, sometimes there could be a tie between two players, holding a Royal Flush. In this case, the pot is split or “chopped” between the two, so both collect an equal share of the winnings. Being an unbeatable hand, the Royal Flush is hard to form as there is less than a 0.0015% chance of hitting it. A Straight Flush is the second best hand in poker which contains five cards in numerical order that are all of the same suit. An example of a nine-high Straight Flush would be  or [Q][J], which is a Queen-high Straight Flush. It becomes evident the Royal Flush is a subcategory of the Straight Flush – the highest one possible. A Straight Flush is tough to beat but the odds of collecting one such hand are relatively low at around 0.0015%, with 40 possible card combinations. If two players both succeed in forming Straight Flushes, the hand with the highest-ranking will win, or in our example, the Straight Flush containing the Queen of Hearts. Also, should two players collect hands consisting of cards of the same ranks, the pot again will be chopped between the two. As the name itself suggests, this hand consists of four cards that are of the same numerical value or rank. The quadruplets can be of different suits, however. The higher the ranking of the cards, the stronger the hand is. The fifth card in the hand is referred to as the kicker and is practically irrelevant, unless there is a tie between two players, both holding the same Four of a Kind. Ties are broken first by the ranks of the quadruplets. If these coincide in rank, the player holding the higher-ranking kicker collects the pot. An example would be a [K][K][K][K] beating a [K][K][K][K]. 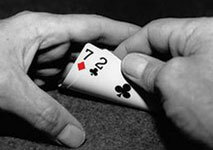 Players’ chances of hitting one such hand are relatively low at 0.0024%, with 624 combinations that form Four of a Kind. A Full House (sometimes referred to as a Full Boat) contains three cards of the same numerical value or rank, plus two cards of the same rank that form a pair. How strong the Full House is, depends on the rank of the triplets. For instance, a Full House containing  would beat a Full House consisting of . As games like Texas Hold’em and Omaha Hold’em involve players drawing community cards, sometimes two players may end up sharing the same three cards. The tie is then broken by the ranking of the pair. One such example would be a Full House of [J][J][J] beating a full house of [J][J][J]. The chances of hitting this hand stand at about 0.14%, with a total of 3,744 combinations leading to a Full House. The next highest-ranking hand is the Flush which contains five cards of the same suit. The cards’ ranks are irrelevant in this case, i.e they are not necessarily in numerical order. The following example shows a Jack-high Flush – [J]. In order to break ties between players, the Flush is ranked first by the value of its highest-ranking card, then by the value of the second highest card, and so on. This means that a player holding a Flush of [Q] would prevail over an opponent holding a [Q] because their second card is of a higher value. If both Flushes differ only in terms of suit, the two hands would be considered of equal rank. The chances of forming a Flush with one of the 5,148 possible combinations are around 0.20%. The next highest-ranking hand is called a Straight and consists of five unsuited cards that have consecutive ranks or values. The following is an example of a Queen-high Straight – [Q][J]. Other noteworthy Straights include the Broadway Straight [A][K][Q][J] (or an Ace-high Straight) and the Baby Straight [A] (or a five-high Straight where the Ace is used as a low card). The chances of forming a Straight are slightly higher at 0.39%. Ties are resolved by taking into account the value of the highest-ranking card in the hand. For instance, a Straight of  would prevail over a Straight of . The combinations that add up to a Straight total 10,240. This is yet another hand whose name indicates what it consists of, namely three cards of the same rank and two kickers that are irrelevant. An example of a Three of a Kind would be [A]. If two players have triplets of the same rank, the value of the higher-ranking kickers would be taken into account to break the tie. If these coincide as well, the value of the lower-ranking or second kickers breaks the tie. This hand is sometimes referred to as “Trips” or a “Set” and can be formed with a total of 54,912 combinations. The chances of hitting a Three of a Kind are higher at 2.1%. A Two Pair contains a pair of cards of matching rank, another pair of a different rank, and a kicker. In the event of a tie, the hands of the two players are ranked first by the value of the higher-ranking pair, then by the value of the lower-ranking pair, and if necessary, by the rank of the kicker. This means a Two Pair of [J][J] would overcome a Two Pair of [J][J][K]. If the Two Pairs are absolutely identical save for the suits, the players split the pot. With 123,552 possible combinations, the chances of forming a Two Pair are about 4.75%. As the name indicates, this hand consists of two cards of a matching rank, plus three unpaired kickers of different ranks. When Pairs tie, the outcome is resolved first by the value of the highest-ranking kicker, then by the value of the second kicker, and if needed, by the rank of the third and lowest-ranking kicker. Ties with Pairs tend to occur more frequently as players’ chances of forming such hands are significantly higher at 42.5%. This is hardly surprising considering there are over 1 million combinations for pairs when a standard deck containing 52 cards is in play. The High Card is the worst possible hand one can get in poker because the five cards it contains are neither of sequential rank, nor are they of matching suits. If a given player has a hand which does not fall in any of the above-mentioned categories, it will be ranked on the basis of the highest-ranking card it contains. In case the two highest-ranking cards of the players coincide in value, the tie will be resolved by the second highest-ranking card, the third highest-ranking card and so on. For instance, a hand of [Q] would beat a hand of [Q] because obviously 6 ranks higher than 5. The chances of getting a High Card are about 50% since there are over 2.5 million possible combinations for this hand. More often than not, the only way for a player to win with a High Card is through bluffing and causing other players to fold. Some of the worst starting hands in Texas Hold’em poker are those that contain a combination of low-rank cards which are not paired. The examples of such poor starting hands include 2-9, 2-8 and 2-7. Such combinations of hole cards are considered bad because it is impossible for players to form high-ranking hands, like Straights, for instance. Meanwhile, if opponents are holding face cards like Kings, Queens or Jacks, this can seriously decrease or even completely ruin the player’s chances of improving their hand. Bluffing the opponents does not guarantee a win for the player holding the above-listed starting hands, which is why it is generally recommended to fold the hand in such cases. At first glance, a starting hand of 2-6 seems acceptable but it all depends on what the Flop shows. If 3-4-5 come with the Flop, a player holding a starting hand of 2-6 may have some chances of completing a Straight. However, their chances of succeeding also depend on the hole cards the opponent has been dealt. If the opponent holds a starting hand of 6-7, they may attempt to trump the hand of the player holding hole cards 2-6. With poker, it is all about how the cards combine. Please note that the starting hands of low-rank, unpaired cards are not the only combinations to avoid. Face cards, when combined with low-rank cards, may also be bad news for the player. Examples of such starting hands include unsuited K-J, A-J, Q-J and even K-Q. The problem here is that even if the player flops a pair, they may end up having troubles with their kicker card. This is not to say players should necessarily fold on starting hands like K-Q or A-J. They simply need to tread more cautiously if such hole cards come their way. Another example of a bad combination of hole cards is when a given player is holding 3-7 or 3-8, which is only a minute improvement from 2-7 and 2-8. The rule of thumb is to fold on such starting hands as well. The Ace to Five Low ranking is applicable to Hi-Lo variations of the game, such as Omaha Hi-Lo and Stud Hi-Lo, where it is employed to award the lower half of the pot. As the names of these two poker variations suggest, the pot is split between the two players holding the highest-ranking and the lowest-ranking hands. If the pot cannot be chopped into two equal amounts, the player holding the highest-ranking hand is entitled to collect the odd chips. This hand-ranking can also be utilized in the less widespread variation Razz, where the hand with the lowest possible ranking wins the pot. In such low-ranking games, the normal ranking is inverted and the suits of the cards are altogether irrelevant. This practically renders hands like the Royal Flush, and the Straight Flush impossible to form because both the sequential ranks and the suits are taken into account there. In such poker variations, pairs of cards actually work to the player’s disadvantage. Thus, a hand that contains no pairs can easily beat another where cards are paired. Also, a hand containing a single pair will prevail over a hand containing two pairs. 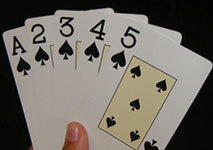 Hands consisting of unpaired cards are ranked by their highest-ranking cards. Aces are considered the lowest in rank here. In lowball games, the Five Low, also known as the Bicycle or the Wheel, is the best possible hand, containing five cards of consecutive rank starting with the five and ending with the Ace as follows: 5-4-3-2-A. Should a tie between two players occur, the pot will be chopped between the two. The suits are not factored in. The Six Low is the second best hand according to this ranking and contains five unpaired cards, the highest of which is the six. Please note the five cards are not necessarily of consecutive ranks, the only requirement is to have a six, which should be the highest of the remaining four cards. An example of a Six Low would be 6-4-3-2-A. However, if a two Six Low hands tie, the hand containing the lower second-highest card prevails. Thus, the Six Low from the previous example will beat a Six Low consisting of 6-5-4-2-A. If needed, the tie will be resolved by considering the third-highest, the fourth-highest or the fifth-highest cards in the hand. This hand resembles the Six Low, the only difference is the highest of the five unpaired cards here is the seven. The following is an example of a Seven-Low hand: 7-6-5-3-A. Ties between players holding Seven Lows are resolved in the same manner as the ties between Six Lows. The player with the lower second-highest ranking card collects the pot, which means the hand from the above example would lose to a hand of 7-5-3-2-A. The Eight Low is considered the worst possible qualifying hand in games like Omaha Hi-Lo and Stud Hi-Lo. It contains five unpaired cards, the highest of which is the eight. Again, the cards are not necessarily of sequential ranks. Ties between Eight Lows break in the same manner as those between Seven Lows and Six Lows. From this, it follows that a hand of 8-7-5-4-2 would lose to a hand of 8-6-5-3-2. The rules of games like Razz differ greatly and there are no qualifying hands there. In such poker variations, the lowest hand always claims the pot, which renders it possible for players to emerge winners even with a Nine Low, Jack Low, or even with pairs of cards.